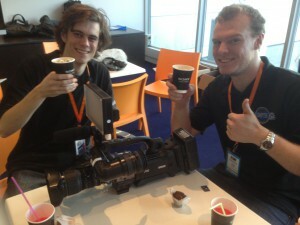 No question that the SMPTE13 Student Video Project was ambitious. Bigger than anything attempted at a SMPTE event (anywhere in the world, we’re told) it was quite a step up from the previous outing at SMPTE11. The pitch: turn the southern end of Hall 3 at SCEC into a popup OB village: project office, truck, temporary control room, edit suites, and a three-camera hosting studio. The aim: bring together whole teams of learners, provide a facility, turn the students loose for four days to chronicle SMPTE13 and bring it to you as live as we could possibly manage. The CSU OB truck dropped into place over the weekend, a hosting set was built and dressed, and over 120 budding content and technology practitioners from Sydney Institute Film Academy at Randwick TAFE, JMC Academy in Ultimo, and Charles Sturt University (Wagga Wagga campus) prepared to bring you the best from the SMPTE 13 Conference and Exhibition. Recording the conference was handled from the truck, and each conference room was set up with multiple cameras. Presentations were recorded and will become part of the SMPTE global digital library, available for future download, repurposing, and distribution through Section Meetings. Meanwhile, under pressure and with real deadlines, teams who had never worked together set off across the floor to capture assigned stories, and develop a few new ones. They delivered a quality result that exceeded even the most ambitious of our targets. By half way through Day Three, the students had shot, edited and produced almost 50 packages. Product reviews, interviews with exhibitors, chats with conference paper presenters, and video segments took you right into the show in a way that few events could do. AGAAG – Live to air! Each day, “A Girl and a Gun – Live” went to air with a hard start time and real deadlines. A magazine program designed as a teaching vehicle, it provided a perfect bridge between what was happening on the show floor and the multicam learning exercise. Nothing was going to get in the way as “the six o’clock news went to air at six o’clock”. In our case, that was 1315, and the clocks were adjusted accordingly. 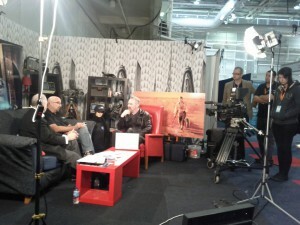 On the set of “A Girl and a Gun – Live” from the SVP hosting studio. Phil and John interview Jean from GoPro. On the first day, technology conspired to prevent playbacks, so the program started and ended cold and ran with no breaks. The hosts riffed as guests miraculously moved on and off the set. On day two the show was perfect, but we missed the record button until 60 seconds in. It was another real-life experience, and the replay was fixed with a quick edit. On day three the audio conspired to move around faster than greased lighting. We watched the replay, debriefed, and discussed how to avoid the pitfalls next time. All good stuff. The final AGAAG-Live episode, broadcast on Friday 26 July at 1100 ran its scheduled 75 minutes as a picture-perfect presentation, with a full crew, multiple guests, live crosses, opens and closes and the full resources of the six-camera CSU OB truck to make it happen. It was exciting stuff. Each day a different team gained the hands-on experience of real life meeting real live. Was anyone watching and how good were the pictures? The stream was publicised on SMPTE’s websites at a level that matched our proof-of-concept approach. In short, we told people it was on and where to find the stream, then went back to the important job of producing content. Despite the lack of full-on publicity, we had surprising number of viewers in places as far away as the USA and India. Thanks to the use of DVN distribution and offsite encoding, we had no worries about bit-starving or interruption, and the picture quality was amazing. The exercise proved that the way of the future can be a mobile device with service levels very much like broadcast television. 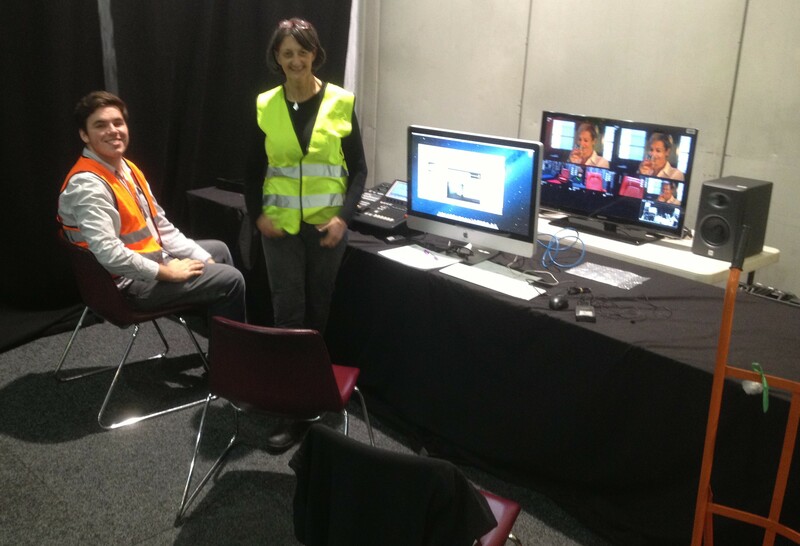 All the episodes aired on Telstra’s network, thanks to DVN interconnection courtesy of SCEC’s Centre Video Production team, live stream compression and management from Origin Digital, and the multi-platform player by Ooyala. The shows will be hosted for replay on this site shortly courtesy of Switch Media. We thank all these supporters who gave freely of their time and assistance to make the SVP output available on the web. 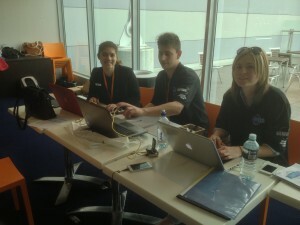 Krystal, Tim and Hayley in the project office, where the CSU scheduling team kept work flowing. Let’s be honest: as media professionals much of our learning happens on the fly in a paid environment. That’s a serious business risk. It’s definitely not ideal. Nobody, especially not your employer, wants a crash and burn experience, so how do you try new things and learn without putting pressure on the bottom line? The SMPTE13 Student Video Project was the ultimate simulation: it allowed wings to be spread, ideas to be trialled, and the results (good and bad) to be critiqued without fear. And how did it look? In our not-so-humble opinion: pretty darned good. But you should see for yourself – check out the videos on the Event SMPTE13 page. The SMPTE13 Student Video Project proved that television is magic! Original publication date 2013-07-28. Updated for reference 2015-01 to include direct click-through links to You Tube AGAAG content.